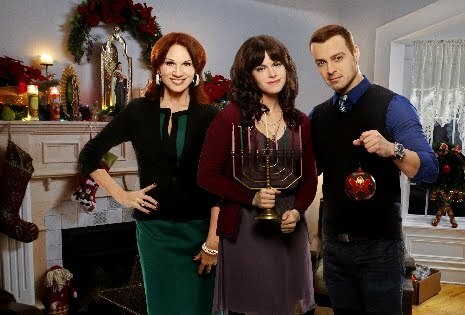 *Hitched for the Holidays is available on DVD! Both Rob Marino and Julie Green are feeling pressure to be in a relationship this holiday season and, after finding each other through a dating website, agree to pose as each other's special someone. Things get complicated when Rob's Catholic family and Julie's Jewish family get involved to help these two make it to the altar. As they double their efforts to keep the charade going through New Year's Eve, Rob and Julie are more than a little surprised when they discover they're actually falling in love. I can't wait to see this movie. My twins are in it as Maria's baby. Hope I can get the hallmark channel in our area. Oh, how exciting for you and your girls! I'm sure it was an amazing experience. I'll be sure to look for your daughters - who shared the role of Maria's Baby! This was suprisingly wonderful! 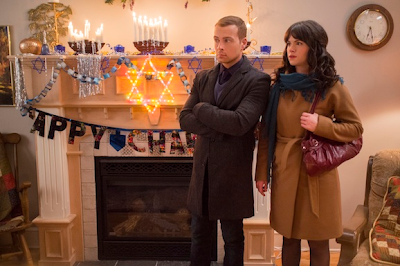 This is the best Hallmark holiday movie of the season! My husband and I laughed so hard. We really enjoyed this and we were pleasantly surprised it wasn't at all cheesy! I will be talking about this on Facebook! It was incredibly funny. Being of Italian and Jewish heritage I so enjoyed this movie. The story and cast is outstanding. I laughed so hard during so many wonderful scenes. Thank you to all involved in this wonderful production! This was so funny and entertaining!! Definitely one of the best out of the new ones this year. Great casting, acting, storyline... Love it!!! I was pleasantly suprised by this. I'm usually a bit bah humbug over these sort of films so I didn't have very high expectations of it, but it was a nice suprise as it wasn't completly cheesy. The pairing worked and it came across as a sweet, funny and enjoyable watch. Great Movie out of all the Hallmark Movies that came out this year this is my Favorite. Great Movie my favorite so far this season from Hallmark. 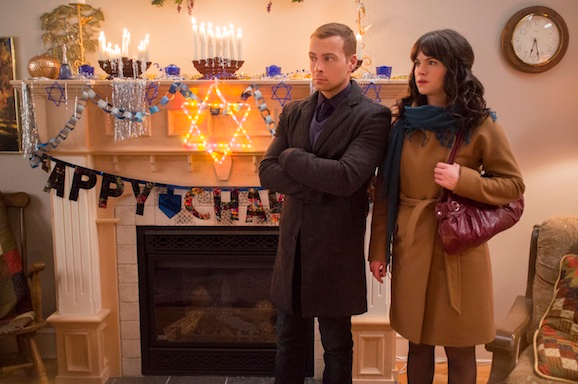 Funny love the part with the Chanukah tree and the Menorah part. Will this movie be for sale? This film was the first one ever done by Hallmark Channel to offend me. I feel the writers, perhaps inadverently, made a mockery out of congestive heart failure and what a family goes through when someone is so ill they may not even live to see Christmas. Admittedly, the year this film came out, I had a family member in hospice care, she didn't even make it to Christmas. One of the conditions plaguing her was congestive heart failure, just like a character in the movie. Honestly, the plot felt like a slap in the face and another stab in my aching heart when someone got better without reason and the recovery carried comedic moments. I know for me, it was very personal. I tried two years later to watch it, based on my mother's suggestion. For me, the pain was just as fresh. It still felt like a mockery was made of my family member and how they suffered. I'm not writing to be rude nor do I want anyone to feel guilty whom did enjoy the movie. I just want people who have been or may be in my shoes to know how I reacted. If you're going through a hard time or still strongly feeling a loss, this may be a movie skip.